Legislators on the Senate Finance Committee today said the Dunleavy administration needs to come clean to the public that the budget’s proposed $714 million in cuts to Medicaid aren’t possible, at least under the timeframe of next year’s budget. The administration is asking the Legislature to cut $249.2 million in state undesignated general funding from the program, resulting in the elimination of an additional $465 million in federal matching funding. The problem is the state hasn’t identified just where many of those cuts will land and has yet to receive—or even apply for—the federal waivers required to alter the program. And because those federal waivers haven’t been approved—and in some cases have yet to even be created on the federal level, like Medicaid block grants—the administration has proposed a “safety net” that would draw out of the state’s statutory budget reserve in case those cuts aren’t attainable. 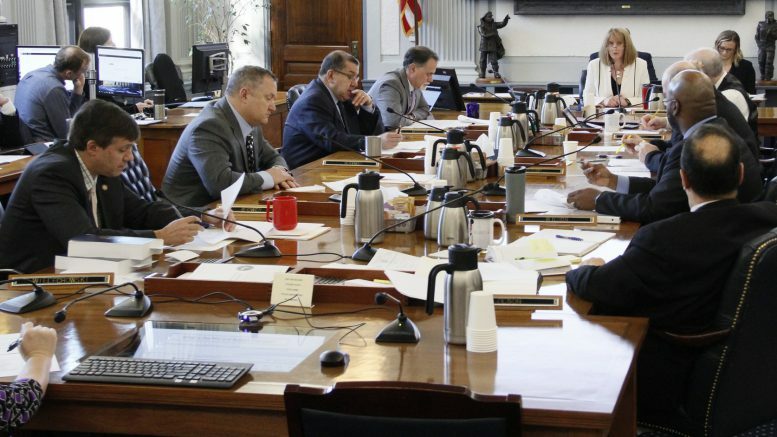 Sen. Peter Micciche, R-Soldotna, and many others said it’s entirely unrealistic to expect any of those to be approved in time and bristled at the idea of drawing out of savings or coming back to the Legislature with massive supplemental spending requests. The hearing was intended, at least in the senators’ eyes, as an update on where the administration currently stands with attaining such waivers. They were hoping to see numbers reflecting what’s realistic and attainable. They did not, and the administration officials—Deputy Commissioner Donna Steward and Administrative Services Director Sana Efird—said the administration is still seeking the full cuts proposed in the Feb. 13 budget. Stedman said the presentation did little to offer the public or legislators any clarity on the reality of the budget, noting that the presentation didn’t put the numbers into a year-over-year comparison so legislators could see the trends in spending. The frustration on the committee was heavy, and legislators said the governor’s unrealistic proposal is creating unrealistic expectations with the public that they’re having trouble explaining. Efrid, the administrative services director for the department, said they hope to have more answers in May. The presentation did get into the changes the administration believes it can make in the next year without approval from the Centers for Medicare and Medicaid Services. That includes a 5% cut to most reimbursement rates paid to providers and a withholding of a 3% inflation adjustment that was expected to go into effect. The officials said the changes are not expected to affect Medicaid eligibility or access to care. Sen. Natasha von Imhof, R-Anchorage, said she was concerned about the interplay between all the various changes, worried that the impact would be larger than the administration suggested. Sen. Bill Wielechowski, D-Anchorage, contended that it would likely affect access to health care because some providers may stop accepting Medicaid coverage. Steward defended the cuts. She said that reimbursement rates raised by about 11 percent between Fiscal Year 18 and Fiscal Year 19 so the 8 percent cut made by the cuts and canceling the inflation adjustment still actually amounted to an increase. Another part of the proposal is the elimination of adult dental benefits. Steward said emergency dental services will still be covered, nothing that the Medicaid population primarily utilizes emergency dental over preventative dental anyways. Sen. Click Bishop, R-Fairbanks, made it clear that he opposed such a change. The administration also attributed some of its potential savings in the upcoming year to a yet-to-be-approved waiver that would allow the substance abuse treatment that’s currently funded all by the state to become eligible under Medicaid coverage. Sen. David Wilson, the Wasilla Republican who previously worked for a nonprofit that delivered substance abuse services, was skeptical about the pitch. That’s because few of the people currently receiving treatment are eligible for Medicaid. “To keep continuing to say the 1115 waivers will match those same dollars, I think is an inaccurate statement until it can be proven. There’s no validity to that statement,” he said. “I’m worried by the additional cut to the community health grants for these providers. … It’s a pet peeve of mine to say that you can bill it to Medicaid. Medicaid is not our holy grail to continue behavioral health or substance issues. Still, don’t let the push back from Monday be a signal that Senate Republicans are interested in maintaining Medicaid at its current level. There were many signals throughout the meeting that they would be interested in cuts, just ones that are realistic. Micciche noted that a real solution for Medicaid would be to tighten eligibility requirements, shrinking the number of people that can qualify for the coverage. Wilson asked about the ability for the state to begin to collect copay fees from Medicaid users, a provision the officials said was possible but currently tricky under the current federal rules. The statement comes less than a week after the state abruptly removed Margaret Brodie, the director of the Division of Health Care Services, the agency that oversees the Medicaid program, from her position. Be the first to comment on "Senators say Dunleavy’s proposed Medicaid cuts are unrealistic ‘flim-flam’"